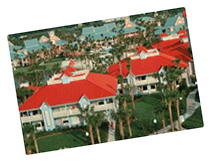 Relax as lush gardens, warm breezes and sunny skies beckon. Five brightly colored “villages” — each named after a Caribbean island — capture the alluring ambiance of the tropics. This island playground features seven pools and pristine white-sand beaches on the shores of a 45-acre lake. With ship-shaped beds, these Pirate Rooms are perfect for the whole crew – Empresses included. 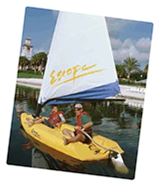 Barefoot Bay provides plenty of opportunities for recreational activities like bicycling and boating. The Fuentes del Morro Pool is a Spanish fortress and water lover’s paradise!